Upon concluding The Consolation of Philosophy, I would say that its great theme is divine providence. Unjustly imprisoned and awaiting execution, Boethius reasons his way to the conclusion that an understanding of God’s government of the world is the key to happiness in any situation. Along the way, as he is explicating the meaning of divine providence, Boethius is drawn into a consideration of how divine foreknowledge and human free will relate. The flow of thought is thus: human suffering –> theodicy –> exhaustive divine foreknowledge –> human freedom. This discussion of human freedom in light of divine foreknowledge is the climax of the book, and arguably its most significant theological contribution. 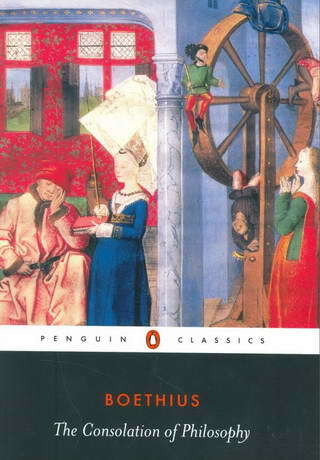 In essence, Boethius argues that divine foreknowledge does not infringe upon human freedom because it is qualitatively different from human knowledge. Like Kierkegaard centuries later, Boethius appeals to the Soctratic principle that knowledge is determined not only by its object, but by its subject. As he puts it: “things that are known are not comprehended according to how knowable they are by nature but rather according to the ability to know of those who are doing the knowing” (161). In other words, the knower affects knowledge just as what is known affects knowledge. Angelic knowledge is different than human knowledge, for example – even when they are considering the same things that we are – because they are different kind of beings doing the knowing. Boethius then argues for a distinction between everlastingness (perpetual duration in time) and eternality (the state outside time altogether). He writes: “it is one thing to proceed through infinite time, as Plato posits, but quite another to embrace the whole of time in one simultaneous present…. God should not be thought of as older than the created world but different in his grasp of time in the immediacy of his being” (169). For Boethius, God’s eternality means more than that he is infinitely old and never going to die. It means that He is Lord over time, and thus equally in all times. Therefore, divine foreknowledge is not really foreknowledge at all – at least not in any way like temporal creatures can imagine foreknowledge. The tension felt between foreknowledge and freedom is permanently relativized by the engulfing difference between God’s knowledge as One who is outside of time and our knowledge as creatures in time. Boethius did not apparently believe in divine sovereignty in the way that John Calvin did. However, I find the central principle of his argument equally illuminating with respect to the classical divine sovereignty/human responsibility dilemma. Is not divine willing qualitatively different from human willing, just as divine knowledge is qualitatively different from human knowledge? Can we not tweak Socrates to say, “everything that is willed is willed not only according to its own nature, but according to the nature of the one willing it?” Or put it in terms of my favorite metaphor: does not an author’s will over a story work itself out differently than the will of a character in that story? Just as Tolkien can see farther than Gandalf, so he can alter the story in ways Gandalf cannot, and in ways that would be unrighteous for Gandalf but are not unrighteous for him. For example, it would be unrighteous for Gandalf to will Sauron into existence. But I cannot say that it is unrighteous for Tolkien to do so. The more I reflect upon God’s nature, the more I come to feel that exhaustive divine sovereignty over all things – for all the zillion conundrums it raises – is the only way God could relate to the world as God. Great stuff Gavin. Especially like how you’ve synthesized Boethius into digestible chunks. The stuff on God’s “fore”knowledge is great. Thanks for the insight.